Adults and children are encouraged to come dressed in steampunk-themed costumes or as fairies. New additions this year include Mad Steampunk Art Show Gala with absinthe tasting, on the eve of the festival, After Event Headlining Act Steam Powered Giraffe at the historic Troy Savings Bank Music Hall, and visiting Inventors of the highest quality. 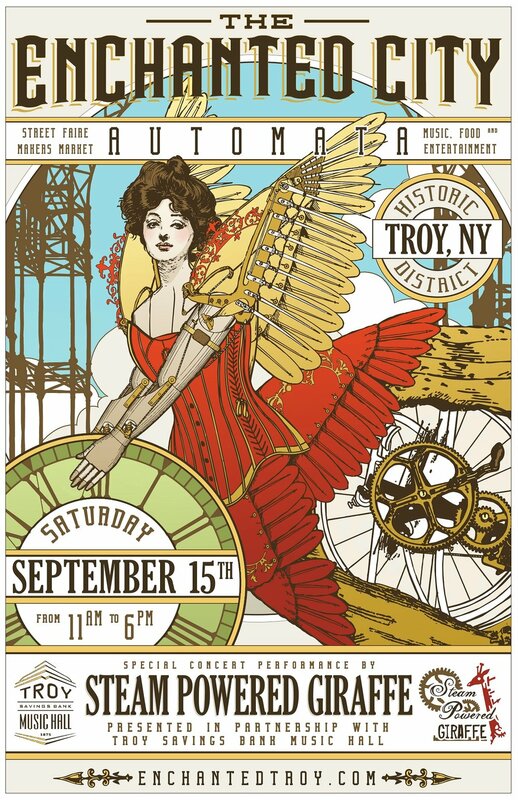 "What sets The Enchanted City apart from all other steampunk festivals is our authentic 19th century urban setting: Troy, New York," said Dunckel. "Like Brigadoon, an entire population of steampunk characters materialize once a year in our city streets and transform the place into living fantasy. It looks and feels like you're in a movie, and in fact, several Hollywood productions have used these city blocks as a filming location and backdrop — including the 2002 remake of H.G. Wells The Time Machine, which is classic steampunk."